The craft discipline I have chosen is as old as the Iron Age itself. I teach Traditional Bladesmithing and the fabrication of pattern welded steels, also known to many as Damascus Steel. Bladesmithing is the art of forging by hand edged implements with high performance characteristics. Over the years I have devoted a large portion of my time to the understanding and fabrication of Damascus steel. I began as an apprentice Blacksmith at the Saugus Iron Works National historic Park in Saugus MA., under the instruction of Steven Nichols. After mastering traditional smithing skills, I turned my attentions to the more specialized area of bladesmithing. 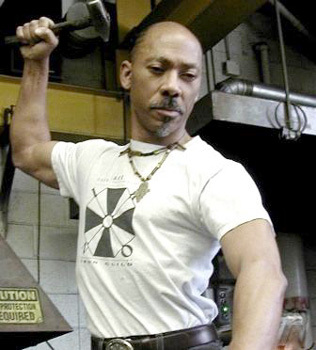 Eventually, I joined The American Bladesmith Society as an apprentice and advanced through the journeyman grade on to the rank of Master Bladesmith., a status enjoyed by fewer than seventy other individuals worldwide. Joseph Shnayder has been in a position to follow his life long interest in producing fine art knives. From the age of 21 he has undergone rigorous training in goldsmithing and the handcrafting of fine jewelry. He received his training at the Art Jewelry shop in Moscow led by head work master Victor Danzig, where he had mastered his skills in goldsmithing, engraving, precious stones setting, forging. His instructors were among the talented artisans who created the famous Faberge eggs. Mr.Shnayder was strongly influenced by the famous Italian renaissance goldsmith and sculptor, Benvenutto Cellini. 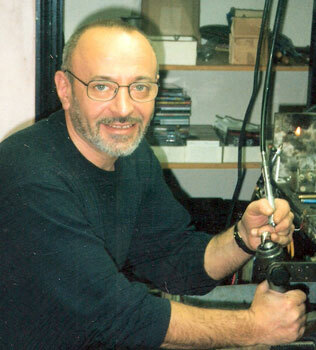 He has worked as a custom jeweler here in the United States since 1988 and owns a jewelry retail store in Nashua, NH since 1997.